Asian Handicap - What is it? Asian Handicap Betting is the fastest growing and most exciting bet type in football. It is also the type of bet with the least spread of up to 2.5% (bookie's commission) so if you are a serious punter, you will be far better off in the long run. The biggest full-time punters in the world bet on Asian Handicaps. Asian Handicap eliminates the possibility of a draw in a soccer game. This means that either the home side or the away side is a winner on your bet. Each team is given a handicap by the bookmaker, which is supposed to balance them so that an equal number of betters will bet each side. In the standard 1X2 wagering, the possibilities of each outcome is 33%. 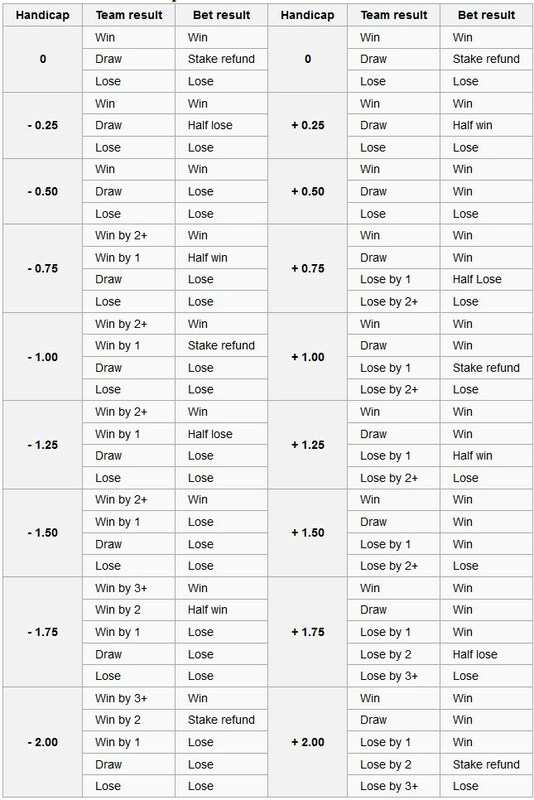 In Asian handicap you have two betting options, betting on home or away, so you have a 50% chance of success. This can be read like: "Milan giving 1/2 ball to Juventus"
Said in another way: Juventus have a "a half goal" (ball) advantage when the match starts. If Milan win the game you will win stake x 2,00 (odds), otherwise you will lose. If Arsenal win the game by one goal you will win half your stake: 1.975 (odds) x 0.5 x stake. If Arsenal win the game by one goal you will lose half your stake: 1.975(odds) x 0.5. This can be read like: "Barcelona giving 1 ball to Real Madrid"
If Barcelona win the game by one goal you will get your stake back. The table below shows the possibilities of win/lose. - Eliminate the possibility of a draw. - You get high prices on favourites. - If a quarter handicap match ends in a draw, you only lose 50% of your stake. - Good fun when following a match live - one single goal is likely to change everything. - When playing multiple betting the number of outcomes are reduced from 27 (3x3x3) to only 8 (2x2x2). - A very high number of bookmakers to choose from. - Bankers. It is possible to bet on "secure" games, which might be suitable for an accumulator. - Bigger odds on outsiders. - Much easier to find value bets. You only need home-draw-away estimations, in Asian Handicap it is required that you are able to predict exact results. Still unsure or not confident enough to bet Asian Handicap for real? Try it out with paper money at our Asian Handicap Competition, each bet is explained in full under real world conditions. - You will get a hang of it in no time and wonder why you didn't start on Asian Handicap sooner! Compete with thousands of other contestants and win prizes!